Cassandra O’Neill, CEO of Leadership Alchemy, has over 25 years of experience building leadership capacity in the social sector. She has worked with over 200 organizations including libraries, schools, government agencies, foundations, and nonprofit organizations. The idea of collective or shared leadership is a different model than that of the conventional individual leader. It is based on shared decision making, transparency, and involving the people affected by change in the process. Current research shows a collective approach to leadership is advantageous to organizations. 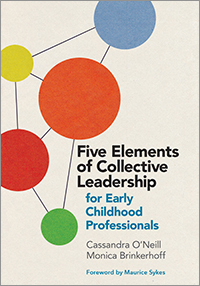 This book helps incorporate the practice into early childhood programs.